The phototherapy devices market is an emerging market in the medical device industry which consists of public and private companies. The companies are engaged in the development, manufacturing, and distribution of the phototherapy devices, and its accessories. Phototherapy devices include light-emitting diodes, fibreoptic, and conventional lamps for the treatment of skin disorders and management of neonatal jaundice cases. Developed markets such as the U.S. and Germany have advanced towards the use of mobile as well as home-care systems for the phototherapy. However, even with the growing demand in the neonatal phototherapy device market, the device popularity remains low in the market. Therefore, the manufacturers are engaged in extensive research and development to ensure patient safety and device affordability in the market. The compromised medical infrastructure in the emerging markets such as India and South Africa act as a constraint for growth of the market of phototherapy devices. The recent advances in the development of phototherapy devices have helped in reducing the instrument size and has helped in enhancing the device portability. Furthermore, extensive research and development in the phototherapy device aims to widen the application areas for these devices. The market remains competitive with the emergence of new players entering the ecosystem. The purpose of this study is to gain a holistic view of the phototherapy devices market in terms of various influencing factors, such as recent trends and technological advancements. The scope of this report constitutes an in-depth study of the global phototherapy devices market, including a thorough analysis of the products across different regions. The market has been segmented into ‘product’, ‘application’, ‘end-user’, ‘configuration’, and ‘regions’. The report presents the reader with an opportunity to unlock comprehensive insights with respect to the market and helps in forming well-informed strategic decisions. The research uncovers some of the substantial parameters that must be taken into consideration by industry players before entering the market. 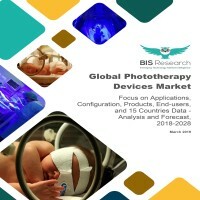 This research report aims at answering various aspects of the global phototherapy devices market with the help of the key factors driving the market, restraints that can possibly inhibit the overall market growth, and the current growth opportunities that are going to shape the future trajectory of the market expansion. The report includes an in-depth examination of the key ecosystem players and key strategies and developments taking place in this market. Moreover, the report includes chapters on market dynamics (market drivers, opportunities and challenges) and industry analysis as well. The research study considers the market share analysis for a comprehensive understanding of the global phototherapy devices market, and assesses the factors governing the same. Opportunity matrix and detailed product mapping have been included in the report. The market by region has been further sub-segmented in various countries, and in each sub-segment the key market trends, list of the key players, and the recent developments that have taken place have been discussed. • What are the major market drivers, challenges, and opportunities in the global phototherapy devices market? • What was the market value of the leading segments of the global phototherapy devices market in 2018? • How will each segment of the global phototherapy devices market grow during the forecast period and what will be the revenue generated by each of the segments by the end of 2028? • What are the influencing factors that may affect the market share of the key players? • How will the industry evolve during the forecast period 2018- 2028? • Who are the key players in the global phototherapy devices and what are their contributions? • What are the key development strategies that are being implemented by the key players to sustain in this market? • What is the market share of each of the companies in the market ecosystem? • What are the major benefits of the implementation of phototherapy devices in the different field of applications including skin treatment, neonatal jaundice management, and others? • What is the scope of phototherapy devices in the regions of North America, Europe, Asia-Pacific, Latin America, and Middle-East? The key players who have been contributing significantly to the phototherapy devices market include Atom Medical Corporation, AVI Healthcare Pvt. Ltd., GE Healthcare Inc., Herbert Waldmann GmbH & Co. Kg, Honle UV America, Inc., Ibis Medical Equipment & Systems Pvt. Ltd., National Biological Corporation, Natus Medical Incorporated, Nice Neotech Medical Systems Pvt. Ltd. Ningbo David Medical Device Co., NOVOS, Philips Lighting Holding B.V., Phoenix Medical Systems Pvt. Ltd. Solarc Systems, Inc., Daavlin, Weyer GmbH, Drägerwerk AG & Co. KGaA, and NeoMedlight, among others. 3.1.1 Regulatory Framework in the U.S.
8.3 AVI Healthcare Pvt. Ltd.
8.8 Honle UV America, Inc.
8.9 Ibis Medical Equipment & Systems Pvt. Ltd.
8.13 Philips Lighting Holding B.V.
8.14 Phoenix Medical Systems Pvt. Ltd. The global phototherapy devices market was valued at approximately $682.3 million in 2018 and is anticipated to reach $1.07 billion by 2028. The incidence of skin diseases such as psoriasis, vitiligo, and acne are growing which impacts the market demand for the phototherapy devices positively. The healthcare infrastructure in the developed market such as the U.S. and Germany has helped in the high adoption of phototherapy devices. The developing markets such as India and South Africa face a relatively lower installation for the phototherapy devices due to lack of awareness and limitations in the medical infrastructure. There are a limited number of market players operating in the market, whereas the market is expected to witness the entry of new players. The product approvals for the phototherapy devices is awaited in the market for some of the new entrants. There is a rising incidence of skin diseases such as eczema, vitiligo, psoriasis, and acne. According to the World Health Organization (WHO), the number of skin diseases has increased globally. The global phototherapy market is currently at a niche stage considering there are products which are yet to be launched in the market during the forecast period. With a low adoption rate in several countries such as India, South Africa, and Saudi Arabia, the market is anticipated to surge rapidly by 2028. North America (45.0%), followed by Europe (30.0%) held the major share of the global market (in terms of revenue) in 2018. Also, North America and Europe are expected to retain the leading positions throughout the forecast period (2018-2028), accounting for shares of 45.3% and 31.6% respectively of the total market in 2028. With the increasing awareness about benefits of phototherapy, growing consciousness about seasonal affective disorders, and high prevalence of skin disorders such as vitiligo, psoriasis, and eczema are the major drivers promoting the adoption of phototherapy devices globally. Further, the anticipated launch of new products would significantly propel the growth of the market for phototherapy devices in North America. The positive attitude towards the use of home-care devices, aided by high per-capita disposable income, has resulted in massive demand for phototherapy devices mainly in developed countries such as Germany and the U.K.. The global phototherapy devices market is segmented by the regions into North America, Europe, Asia-Pacific, Latin America, and Middle-East. North America is the leading contributor to the global phototherapy devices market.